Hope isn't wishing. Hope isn't dreaming of what might be. Hope in God is like the knowledge of the coming of spring. 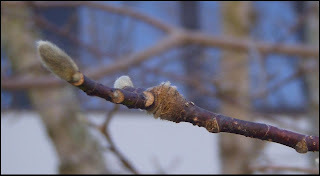 No matter how cold it is, how much snow has fallen and how many inches of rain fell that immediately turned to ice, no matter how many days the kids have off from school, there is still the knowledge that eventually spring will come. Hope in God is the confidence in his active presence in our lives even in darkness. We don't wish for his to be in our lives. We know that he is. That is our hope. We had a surprise snow squall today -- 5 extra inches. Steve and another gentleman from our neighborhood spent two hours shoveling the snow off of the entrance hill to our subdivision. They cleared the hill for the over 100 people living in our neighborhood. It will probably snow again, but that didn't stop them. My mother-in-law, Judy, used to always have Windex and paper towels. If you visited her, before you drove away, she would go out and clean the windshields of your car. Your windows would get dirty again, but she did it anyway. We buy greeting cards for people even though they will probably throw them away after reading them (if you know me, ask me about this). Why do we do these kind of things? Why buy cards? Why did Judy clean windows? Why did Steve clean the hill? Because the grace is not the card, the grace is not the clean window and the grace is not the clean hill. The grace is in knowing that someone cared enough about you to spend the time finding the "right" card that says what they want you to know. The grace is in knowing that someone else cares about the other people in the neighborhood enough to invest 2 hours in giving them a semi-clean, much safer place to drive their cars. The grace is in the knowledge that someone loves you enough to want you to be able see well through your car windshields. The grace is in the love offered. 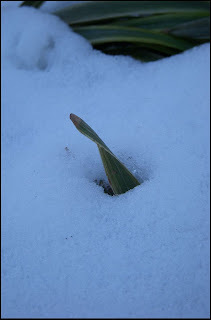 And that grace has a permanent effect that snow or dirt can never touch. The grace and the love are transforming. I read today in a Disciplines devotional that God is not hidden. God is all around us. Do we walk around sometimes as if God were a shy God, hiding from us, challenging us to find him? Do we act as though he's hard to find? But is that the way God really is? Would a God who didn't want to be found and known go to the trouble -- go to the extreme action -- of sending his son to become a human like us and to reveal to us the Father's very nature? Seems like a rather paradoxical action for a God who wished to remain hidden. So, if God is a God who wants to be known, then what's keeping us from finding him? The devotional asked what actions we take each day to make God known -- to find him. Are there practices you have adopted which are designed to open your eyes to God? 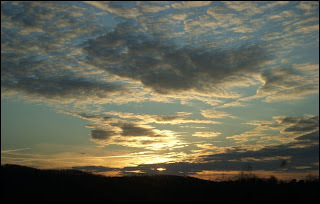 This blog -- I write to explore my own thoughts about God and faith. Writing it makes me think about it. My camera opens my eyes to the presence of God. I try each day to read a devotional writing and a supporting scripture. 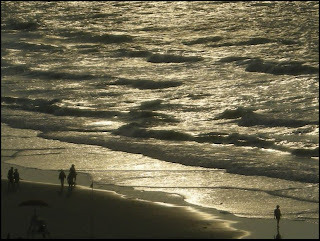 Christian conversation -- when I find myself wondering about God's direction for my life, I often ask friends -- am what I'm saying or doing make sense? Is God in this? Hopefully, I worship God in a way which reveals him. Prayer can certainly reveal God. I need to do more of it. Quiet time spent in God's presence. It's nothing really unusual or amazing, and I'm sure that I could do a better job -- a much better job -- at it, but this is where I start. Image: Snow covered roadside as we left the airport on Wednesday. I like to drive. I like the freedom of being able to jump in the car and go where I want to go. I don't like snow. I don't like that it hampers my ability to go where I want to go or need to go. 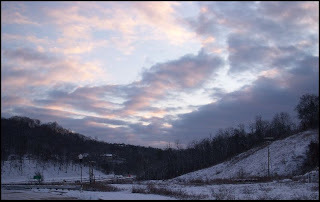 We live on a hill, and that downhill drive just further complicates travel in bad weather. 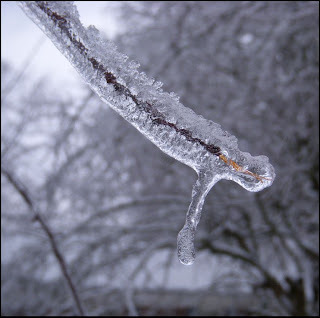 Last night, as it rained and froze, I could hear the world popping and cracking as everything around us was encased in frozen glass. Unlike some people in our town, we didn't lose our electricity. We even still have cable. For a while this evening, I was without Internet, but that kind of loses its impact when you have an iPhone. Anyway, not only did we have to deal with ice this morning, but a tree fell during the early hours of the morning (sometime between 6:30am and 7:00am) blocking the only entrance/exit to our development. By the time we walked off the hill this morning, some industrious person had removed the center part of the tree, opening up the road. In times like this, the neighborhood starts to work together. Steve and some other men from our housing development got together yesterday and cleared the hill using shovels and with the help of someone driving by who had a blade on his truck. This morning, when I was thinking we would have to wait for I wasn't sure who to come by and remove the tree someone who lives up here just went down and cut up the tree. After the state road plow came through this afternoon (wonder of wonders), Steve got busy and shoveled out the driveways of several people who live near us. Times like this seem to pull people together. I forget that when the sun in shining. Still doesn't mean I like snow. I do not. I mentioned earlier than in Sunday School this Sunday we talked about the story of Samson's birth. We discussed the idea that the angel tells Samson's mother that Samson is to be a nazarite. I noticed that this requirement is stated right before the angel tells his mother that Samson shall deliver Israel from the hand of the Philistines. I imagine that was huge -- a very large task for Samson to accomplish. A huge task for his mother to contemplate. I wonder if the lesson in this for us is that large tasks come with a price. Sometimes I wonder if we sit around, waiting for something giant to happen, when what we really need to be doing is the hard work necessary for the dream to happen. I take notes during sermons. I started doing it years ago because I kept hearing thoughts and ideas that I wanted to be able to remember. I've kept doing it for that reason, but also because I have found that it is a way to increase my focus. Maybe it's a leftover from being in school, when I took notes in lectures, but now, if I've listening to a sermon (or any other kind of talk) my hand itches to take notes. I carry a blank book with me to church, but if I don't have it, then I'll write on an offering envelope, a napkin, a bulletin -- whatever I can find. This Sunday, our associate pastor, Rev. Jeremiah Jasper, preached. I pulled out my notebook to write down my notes, and instead of notes, I found that instead of regular notes, I was writing a poem. The sermon was called "A conversation with Jesus" as was based on Mark 1:14-20. More than you have ever been blessed. How long will you struggle? until you will say yes? How long will you fight me? more than you have ever been blessed? A grace greater than your excuses. A grace greater than you know. More than they have ever been blessed? Will you let me fill you? Will you be a vessel of peace? Will you follow me when I call? Have you ever had a few things happen which seem unrelated, and yet when you consider them together, seem to make a point? I was talking with a group of friends Saturday morning. One of them stated her belief that it is scriptural that the man is the head of the household. We protested; in fact, I was just a little shocked to hear this woman, who is a leader in her church and in her profession would believe this way. Today in Sunday school we talked about Samson's parents. Do you know what their names are? Manoah and his wife. Notice that his wife has no name. The angel visits the wife -- more than once -- but the author of the passage or history itself didn't see fit to record her name. A few days ago I saw a juxtaposition of a familiar hymn: "Jesus knows me, this I love." I like that. 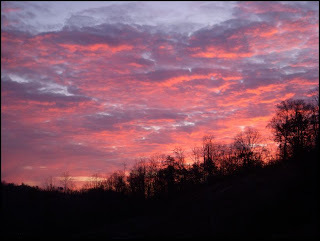 How about this one -- "Our father, who art in heaven, how he knows my name." And one more, from the song The Summons, which we sang in worship this morning. The first two lines of the fifth verse are, "Lord, your summons echoes true when you but call my name." God know us. Each one of us. He knows our names -- and everything that implies. The angel came to visit Manoah's wife, and I guarantee that God knew her name, even if we do not. Not only did he know her name, but her name was important to him, just as she was important to him. She mattered. She mattered to God as much as Manaoh did. If grates against my big picture of God to believe that he would value men more than he values women. That's not God. And you can tell me all you like that different roles do not imply different values to God, but I disagree. To state that men are the head of the household solely because of their gender implies a value placed on them by God based solely on their gender. And that's not God. 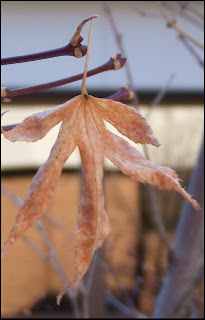 Image: Leaf from John XXIII Retreat Center. Today is the one year anniversary of the death of Jim Ray, a very special man. We still miss you, Jim. Please give us five suggestions for combating cabin fever and staying cheerful in our monochromatic world? First, sometimes monochromatic is beautiful. When I'm thinking that the world is ugly during winter -- all one color, dead looking -- I take my digital camera out into the world and start taking pictures. 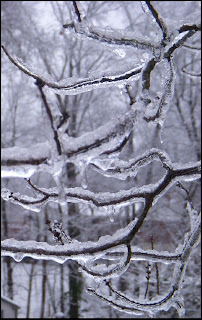 Yesterday, at our local Catholic retreat center, I found stained glass, a fountain, tree buds, interesting bark and snow. The world is always alive with the presence of God if we'll look for it. Cook something fun. Soup. Homemade bread. Or if you have to come home from work in the dark, plan ahead. Start something in the Crock Pot -- yesterday it was a chicken. There is nothing like coming home and smelling food that is ready to eat. Candles in the fireplace -- easier than an actual fire, and it still looks cozy. Burn those candles. What are you saving them for? Turn off the TV and have dinner with your kids. It's really interesting what they will say when given attention. Get out and have dinner and coffee with friends. It brightens up your world (at least, it does mine!). I was at a meeting today that opened with a devotional delivered by Dr. JF Lacaria. He based it on Psalm 62. He read it from The Message. Go and read it -- it's a great Psalm, and it was especially inspiring to hear JF read it in this paraphrase. He then told a story from his recent mission trip to South Africa. A Methodist church -- Central Methodist Church -- has opened its building to refugees from Zimbabwe to spend the night. Each evening they have a worship service with communion, and then over three hundred people find a place to sleep in or near the building. This is what church is meant to be. It is meant to be Central. It is designed by God to give us a foundation -- a strong connectional place, where we can go when the world is crashing around us. A safe harbor. We have a God we can trust absolutely. Do we only realize that when we are in trouble? Do we truly know it when we are safe and sound -- not in danger. How would life be changed if we knew that -- daily -- our help and glory are in God. How would life change if God were Central? 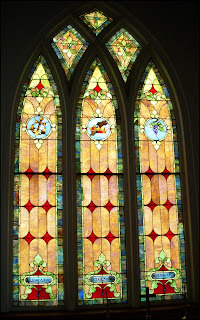 Image: Stained glass from John XXIII. What is the purpose of an invocation? The City Council [of Newport Beach] believes that the purpose of an invocation is to recognize the role that freedom of religion has played in the history of this country and the contribution that religious groups make to the quality of life in this community - and not to promote or discourage any particular religious belief. I'm there to invite something greater than any of us to be present among us as we take up matters of gravity or rejoicing to the larger community. Which definition resonates with you? I disagree that the purpose of an invocation, even a "civic" one, is to recognize the role of freedom of religion. I do like the idea the purpose of an invocation is to invite something greater to be among us. I might add that an invocation can also be an invitation to those present to prepare themselves to notice the presence of one who is greater. If a minister or a lay person accepts the invitation to pray an invocation at a civic event, then he/she is accepting the challenge of invoking the presence of a higher power to a group that is probably more diverse that the group found in a church -- a group that can be expected to be of similar beliefs and denomination. I don't think that it is an opportunity for conversion. It's a time to invite God's people to be present to God and an invitation for God to be present among his people. I think that leading group prayer means that one is standing before God and being the voice of all those gathered together -- whether in a church or in a civic event. If we accept invitations to do that for a diverse group, then we are saying that we are willing to "stand in" for all of them before God. I don't think that praying a pray which is distinctly of one belief set is offensive or exclusionary -- not really. I do think, though, that doing so is to abdicate responsibility for praying for all of those present. If we accept an invitation to be the voice for all gathered, and we are only the voice for those of own belief set, then we've failed in some way. There are ways to achieve this kind of balance without compromising our own beliefs while at the same time, offering a universal prayer to our God, who has ears for all. I really enjoyed Rev. Lowery's benediction. The very first line -- "God of our weary years; God of our silent tears." and "when tanks will be beaten into tractors." were my favorites. Obama said something like "we extend a hand to you if you will unclench your fist." Good image. What happened to the oath? What went wrong? Seemed like none of it was right. Aretha's hat. My goodness. And we certainly don't sing "My country tis of thee" like that at Rotary. It would be much more fun if we did! And I loved loved loved the piece of music arranged by John Williams and performed by YoYo Ma, Itzahk Perlman, Gabriela Montero , and Anthony McGill. It was terrific, and not only that, but the musicians seemed to find such JOY in it. If you didn't see it, go to YouTube and watch it. One must admit, no matter who one voted for, that there is something inspiring and uplifting about watching an inauguration. This peaceful transfer of power is something that we can take for granted, but when it is so wonderfully right in front of us, we cannot help but celebrate this illustration of our freedom. What are 5 things that people should know about you? (or, me, in this case)... I'm choosing five small details on the theory that if you know me, you probably already know the big things. I liked geometry. I liked genetics. I liked physics. I didn't like chemistry, and I wasn't very patient with English (because I thought it was very subjective and up for interpretation). I like logic puzzles but not cross word puzzles. I like to make things and enjoy playing with color. I can build a web page or knit a sock. I can create a newsletter on the computer and I can create jewelry. I like to read, and I used to always finish a book if I started it. Now, as I've grown older, if I don't like it, I don't finish it, and I don't feel bad about it. I overlooked the idea of God speaking to a 12 year old. Our associate pastor asked the youth today what God was saying to them about their faith. They all kind of looked at him as if they had never thought of the idea of God speaking to them, personally. Do we teach our kids that God will communicate with them, if they they will listen? Do we admit that to ourselves? Do we think that kids don't have relationships with God? Do we just assume that God will be silent with children and youth? The news that God shared with Samuel was heavy and stunning. God knows us and God knows his children. He knows what to tell them. Maybe we just don't expect that he will. I was at a funeral on Wednesday. The pastor said that the call a minister hears is a force on life. A force on life. While I do believe that pastors have a special call, I think that we are all called. Doesn't it feel like a force on your life sometimes? He then said that the gentleman who had died had done more than he could have with his own power. The next day, another person in the office and I were talking about what we do, and she said, "I am doing so much more than I used to -- it's amazing to me." We are doing more than we could with our own power. That's what happens when we yield to our call -- to the force on our life. Force -- power -- both from God. One of the lectionary readings for the week is I Samuel 3:1-10. This is the passage in which Samuel, as a boy, hears God calling him. He thinks it is Eli, the priest, who is asking for him to come, so he keeps answering the call by going to Eli. Eli finally tells him that it is God, and that he should listen. Clued in, Samuel pays attention. Samuel is sleeping in the temple, right next to the room with the ark of the covenant. In other words, Samuel was as close to God as he could get. Even this close, he doesn't recognize God's voice. Sometimes we're like that. God could be standing right in front of us, and we don't know it. Samuel doesn't recognize that God is calling him until Eli tells him so. There are times when we are Samuel, needing help to find God, and there are times when we are Eli, called by God to point out His presence to someone else. We need to be open to both possiblities. God doesn't give up. Even though Samuel remains oblivious, God keeps calling. God tells Samuel that He is going to do something which will cause the both of the ears of those who chose to listen to tingle. How about that? There are times when I would like to say to someone, "God is about to do something so unexpected and wonderful that even your ears (both of them) will tingle." Do we believe in possibilities like that? 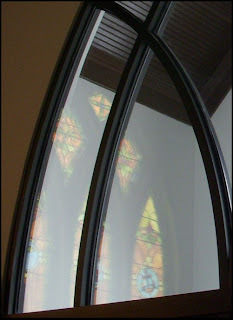 Images: Stained glass window at Trinity UMC, Pt. Pleasant, and the same window, reflected in the doorway. Today, I went the funeral of a gentleman that I've never met. I debated whether I should go or not. It seemed a strange thing to do. He was known by the other people in our office, but not by me, and I wasn't sure how others would see my attendance at the funeral. I thought of reasons why my going might be a benefit to the Foundation, but that didn't seem to hold much water. As I was thinking about it, I realized that I would go -- because I wanted to go. It seemed a simple reason, but I worried that it was too self-centered. I read a lot of Trust Agreements, and I go through a lot of files. One of my favorite parts of those tasks is reading about the donors -- getting to know their stories. People are wonderful, and their reasons for giving to their churches are a joy to read. I have developed this feeling that the Foundation is more than a Trustee for funds. We are also a Trustee of legacy. We hold the memories of those who have given gifts or who have been honored or remembered through a gift. It is a blessing to learn the stories. So, I decided to go to the funeral so that I could learn this gentleman's story. It was a funeral which gave glory to God, and I am so glad that I went. I learned about this gentleman, and I experienced a wonderful time of worship. Near the end of the sermon, the pastor said, "When Bill's memory began to fail, God held those memories in Trust for him." 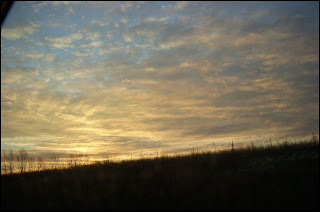 Image: Sky on the way to work this morning. The discussion of the matter turned almost to a defense of an individual's right to stand up for one's faith. Is it really that? Is saying "Merry Christmas" really standing up for one's religion? When it becomes more important to say "Merry Christmas" than to remember the feelings of the person standing in front of us, then I think we might be doing something which is within our rights, certainly, but is not beneficial. In my previous job, I worked with people of many faiths. I doubt any of them would have been insulted by my Merry Christmas wish (although they might have found it strange), but if they had been, wouldn't it have been a poor witness to my faith to insist on the phrase? Even though it is within my rights to do so? And do we really think that we will evangelize people by saying "Merry Christmas?'' Is it really a tool of conversion? It may be lawful, but sometimes we need to think about more than the law. Today prior to worship, Jack was sharing the pastoral concerns with the congregation. This is the time when he tells of us deaths, illnesses - those items which need our prayer and concern. An older member of our congregation died late last week. A tradition of our congregation is that a white carnation is placed on the altar in memory of someone who has died. This Sunday, the altar was covered in flowers and a very large nativity scene that we use each year. If he had placed the bud vase with the flower on the altar, no one would have seen it. Instead, he had placed it on the altar rail. As he announced the member's death, and pointed out the white carnation, he said, "I hope you will excuse me for extending the altar out to this point since the flower would have been hidden if we had placed it in its usual location." That phrase caught my mind. Extended the altar. Merriam Webster defines altar as a place where sacrifices are made to the Lord -- the center of worship. Perhaps our altar needs to be extended on a regular basis. Perhaps we need to realize that we are called at all times to give ourselves to God and to worship him. Our faith is one of extended altars. The sermon title in our church tomorrow is "remember you baptism." While the United Methodist church doesn't practice "re-baptism," we are encouraged to remember our baptism -- what it means and God's action in our lives through that particular sacrament. As I was thinking what to write tonight, looking through other people's blogs, I ran across that phrase. "Remember your baptism." Do you remember you baptism? If you do, and you're reading this, and would like to share, leave a comment. I was seven years old when I was baptized in a local Presbyterian church in town. I do remember it. 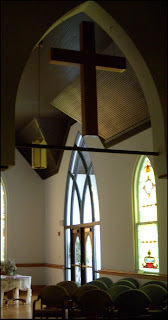 I remember wearing a white dress and standing up in front of the sanctuary during the worship service. I remember the minister sprinkling water on my head. I don't think at that point that I had any realization what that sacrament symbolized. In fact, we called it a Christening. For many years, even through high school, after I started going to a United Methodist church, I worried that I hadn't been baptized. Of course, I had been, but the terminology had thrown me. I remember having our boys baptized. They both wore white pants and a white cardigan (the same white cardigan for both of them -- double breasted). They looked as cute as could be. Can you see the influence my baptism had on my son's? White. Must wear white for a baptism. For them, though, I did know what it meant, and it was a joy to bring them into the family of God. Remember your baptism, and remember what it meant. How does it feel to be a child of God? I'm Friday-tired. So here's a Friday Five from RevGalBlogPals. It's all about pancakes (I'm posting a very serious post tonight! Scratch or mix? Buttermilk or plain? I don't know. I'm not sure if I've tried them to notice a difference. Being on Weight Watchers, I don't eat pancakes very often. Pure and simple, or with additions cooked in? I definitely like them pure and simple, but I also like them with pecans cooked in. Not much other than that. For breakfast or for dinner? Oh, both! Breakfast for dinner is a great idea (as is breakfast for breakfast. Preferred syrup or other topping? Maple syrup, hands down. Lately it's been sugar-free, to save on the points, but even that's good. How about the best side dish? Bacon! Following that would be scrambled eggs. Ortberg in Faith and Doubt used the image of a trapeze artists to describe faith. Think about a person swinging on a trapeze. There comes a point when he has to let go. In order for the act to work, he has to let go. Once he does, he is in free fall, flying, but totally out of control. He can't control the catcher. He can't control his speed or his final destination if the catcher should fail. It all rests in the hands to the catcher, who is usually not in the spotlight -- not the "star." The flyer has to rely on the catch to catch him. In the same way, we have to let go. We have to let go of all of those things to which we hang on and let go, trusting in God to catch us. We have to give up control and fly. Ortberg says that the word for trapeze comes from the ancient Greek word trapeza, which means table. It is only used in the New Testament when Jesus gathers his disciples around what we will call the communion table. He tells them that they have to let go, and fly, in order to follow him. 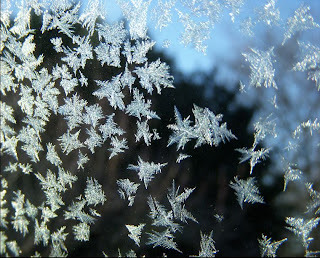 Image: The picture above was taken this morning as I got in the van to go to work. I was thinking about yesterday's post, and how I need to take time for pictures, when that one jumped out of the tree and onto my camera. I was reading the Disciplines devotional for the day, which is based on Psalm 29:1-6. I like this Psalm; in fact, it has inspired a poem. The Discipline author talked about finding the glory of God in His creation. 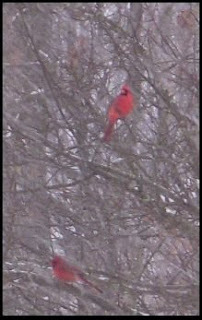 As I finished reading this morning, I looked out the window. It was a dreary winter day with the rain falling in a steady drizzle, the sky gray with no sun visible. I thought about how hard it is to find the glory of God in a day like that. I know -- I know -- we need the life giving rain, the clouds have a purpose -- but it doesn't look glorious like a sunrise or a fall tree or a flower. I haven't been taking very many pictures lately. 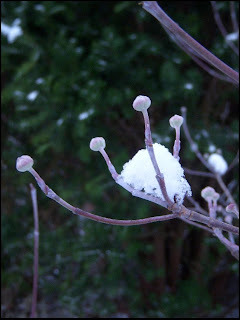 It's hard to find subjects for photographs during seasons like this one. I work in a building near other downtown buildings unlike when I worked at the VA and there was a meadow next to the parking lot. My routine is different. I'm just finding it harder to find visible evidence of God's glory in nature lately. Or is all of that an excuse. Am I not keeping my eyes open? Am I missing it? And yet, this morning, a woman called the office. Her good friend had died, and this woman wanted to open an Memorial Trust in her friend's name. In that, I could easily see the glory of God. Sometimes, even on a quiet, dreary day, the glory of God sings. 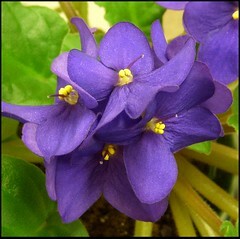 Image: The African violet in my office. As I sat there, thinking I wasn't finding anything to photograph, I noticed the flowers blooming less than 3 feet from my desk. Hear my Prayer, O Lord -- Confessional prayer from Psalm 17:1-7. Love Like We've Never Seen -- John 17 . Other stanzas from Don't Get Comfortable by Brandon Heath. I wrote a post a day or two ago about Changes -- how some people want change which is innovation and some want change which is renovation. Completely new or rebuilt. Psalm 85:8-9 -- Let me hear what God the Lord will speak, for he will speak peace to his people, to his faithful, to those who turn to him in their hearts. Surely his salvation is at hand for those who fear him, that his glory may dwell in our land. 2 Peter 3:10-13 -- But the day of the Lord will come like a thief, and then the heavens will pass away with a loud noise, and the elements will be dissolved with fire, and the earth and everything that is done on it will be disclosed. Since all these things are to be dissolved in this way, what sort of people ought you to be in leading lives of holiness and godliness, waiting for and hastening* the coming of the day of God, because of which the heavens will be set ablaze and dissolved, and the elements will melt with fire? But, in accordance with his promise, we wait for new heavens and a new earth, where righteousness is at home. One of the scriptures is prophetic. The prophetic view states that if we are faithful and repent, God will "restore our land." In other words -- reformation. The other scripture is apocalyptic. In this view, the world needs destroyed and replaced with a new one. Innovative change. It started me thinking about transformation. The changing of who we are, by God, into who we were meant to be. It is impossible to do, and yet God does it -- he begins it now and finishes it in the not yet. Thinking about how I have changed -- am changing, I hope -- is it not true that I have been (and am being) recreated? Is transformation so all-encompassing that the result is actually apocalyptic, in a way? Have I not (and am I not being) replaced by something new? On the other hand, is that something new what I was intended to be all along? And is that not prophetic, in a way? Changes. God changes. Transformation from what we are to what we will become and were created to be all along. 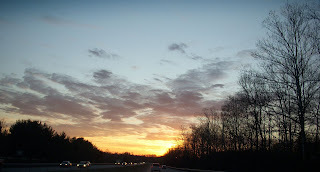 Image: Sunset on the way home from work. Our office meeting devotional today was based on Isaiah 41:10 (above). What are we afraid of? What does it prevent us from doing? Why do we fear when we should trust? It was -- I was going to say ironic, but that's not really the word I mean. Perhaps a God-moment -- that this was Sally's topic of the devotional. Earlier this morning my mind had been wandering around some of the same questions -- although along a slightly different path. What does it mean to say that I trust God? What am I trusting him to do? I don't believe that my faith in God will prevent bad things from happening. Even if I believe that God has led me to this place where I now stand, I don't believe that trusting him means that I get to stay here. This is not a protected place -- not a place protected by my trust in God. So why does it sometimes seem like fear is the opposite of faith? I'm not sure that it is. Yes, fear can be an obstacle to obedience to God, but do I expect my faith to lead me to a fearless life? I don't think that it can. I think that there will always be fear, and there will be loss, and there will be pain and sadness. And aren't those things to be feared? If trusting God doesn't prevent them, then how can I expect to live a fearless life? I think that might be unreasonable. I was reading the blog Enter the Rainbow this evening. Andy, a United Methodist pastor, wrote about two different kinds of change -- innovation and reformation. Innovation is the creation of something new; reformation is the recreation of something that already exists. It's a good post, worth reading. Just click on that link above. I hadn't thought of change in that light before, but I do think he's correct. And why is it that in our churches we take the stance that we should do one OR the other, and not both? Think about the New Testament. Jesus took the Passover meal and recreated it for us, into a communion meal. He didn't say the expected words or do the expected actions. Think about the money changes -- he didn't reform that system, he sent it packing! Think about rich young ruler -- give away your money and follow me. That's not reformation, that's asking the man to give up everything and start a new life. It appears to me that there are times for both options. Why do we sometimes insist that they compete -- that one is right and one is wrong? What innovative ways can we think to do both? How about 1000 words via a picture? I took down my office tree this morning. As I was packing away the ornaments, I noticed that many of the ones that I had purchased this year were words -- silver 'hope,' 'peace,' and 'joy' ornaments, a nativity 'noel' that sat under the tree. Even the nativity scene I bought for the office was the word "Joy" with Mary, Jesus and the Baby. I didn't do that on purpose -- I just purposefully set out to add Christian thoughts to a tree which previously (because of its location) been almost a non-Christian tree. We sometimes talk in church about the words we use -- words like epiphany, liturgy, eucharist, redemption, and justification. We talk about how those words must be foreign to someone on the outside, who doesn't know the lingo. I was reading a devotional this morning based on Revelation 21:1-6a. One of the verses says, "Now, the dwelling of God is with men, and he will live with them." The Disciplines devotional talked about God dwelling among us, and how we have seen it. The author talked about South Africa, and said it was "where the language of the church was moved into the streets as reconciliation took on flesh." We worry about words like justification and sanctification. I wonder if we should instead be focusing on words like peace, joy and hope. How are we, as Christians, bringing these words into the world? How do we enable this essential language of the church to move into the streets and take on flesh? How do we allow God to be incarnated through what we do, and brought into the world? It seems to me that people need to know the power of these words. It seems to me that these words could make a difference in lives, on the streets and in the world. Are we taking these words to the streets? In Ortberg's Faith and Doubt he talks about how we view God. Our experiences, our worries and doubts, our guilt, our mood -- all of them influence how we look at other people. We project all of these things onto the people standing in front of us. How we relate to people is effected by all of the things. In the same way, says Ortberg, "we project our own falleness on God." I think that we reduce God to our own level. We can't provide grace to people, so we can't imagine that God would. We can't love unconditionally, so we can't imagine that God does. We seek revenge, so we give God that characteristic. When something goes wrong in our lives, we blame God, because if he is all powerful, then surely he would cooose to use that power in a way that we would -- a way that is affected by our own sin (which would not shape God's use of his power). When we should be following God, shaping our lives in response to the way that he would want us to live, we are instead shaping our perception of God by the way we live our lives. Image: Sunrise a couple of days ago.